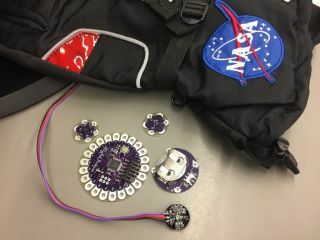 A "happy suit" with built-in wireless sensors would recalibrate astronauts' environments in real time to reduce stress. Researchers from Florida Polytechnic University are developing a "happy suit" that they say will protect astronauts from the psychologically harrowing effects of space travel. The technology's network of wireless sensors would respond to the wearer's vitals by recalibrating his or her environment in real time. These adjustments could include changes in temperature, light color, light intensity and oxygen levels, Arman Sargolzaei, an assistant professor of electrical engineering at the school, said in a statement. "It's vital for astronauts to be mentally healthy during missions and right now there's no active, real-time solution to help them when they feel stressed or anxious," said Sargolzaei, who is collaborating with Melba Horton, an assistant professor of biology, and computer-science student James Holland, on the project. "This technology would provide them with immediate relief to their state of mind." Funded by a grant from NASA's Florida Space Research Program, the so-called "Smart Sensory Skin," also known as S3, could eventually be incorporated into astronaut clothing as well as spacesuits, so that doctors on Earth can track the wearer's blood pressure, heart rate and joint angles. Although similar technology exists, it is "cumbersome and often uncomfortable," Sargolzaei said. Plus, the data is passive, meaning it must be reviewed by a physician before recommendations can be made. The S3, on the other hand, will not only be lighter and more ergonomic, but it'll also play an active role in making astronauts "happier, safer, fitter and more productive," he added.